Here is another fun card to share with you. The name of the set doesn't give enough credit to the versatility it can give. Swirly Bird was a set I wasn't sure I was convinced that I needed, but I decided since it was available to me on the new catalog pre-order, I should give it a go. Here is the card I created...and not a swirly bird in sight. I used the new Dapper Denim Ink and paper to contrast with the Pool Party Paper. I have decided I really like these two together. Along with those I added a touch of Pink Pirouette, So Saffron and Crumb Cake. Did you also notice the label for the sentiment? There are some fabulous new dies in straight and scallop edges. Squares, circle and hearts. Oh, and do you like the swirly seas for my little boats to sail on? This is part of the die cut set, Swirly Scribbles, that goes perfectly with the Swirly Bird stamp set. 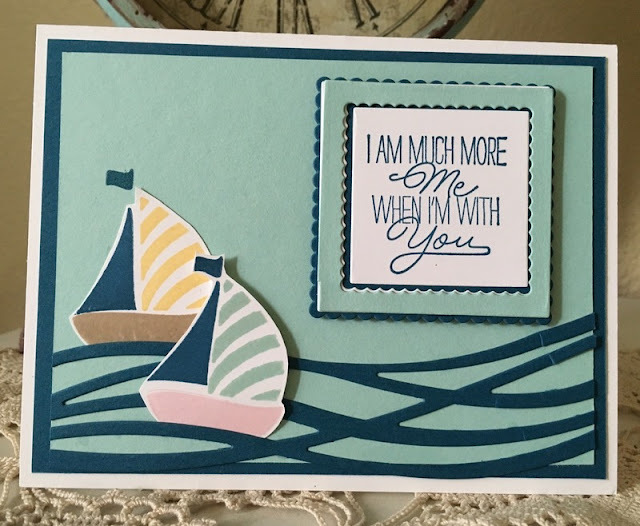 And if that doesn't overwhelm you enough, the sentiment is from a new stamp set that will also be available: Layering Love. I should have created one of the fun bird and swirly cards that shows of the quirky, fun feel of this set, but all in good time! These little boats make me smile. Pretty card! I love that set and I'm anxious to get more ideas for it! Love the swirly seas... I think that die set is calling my name! 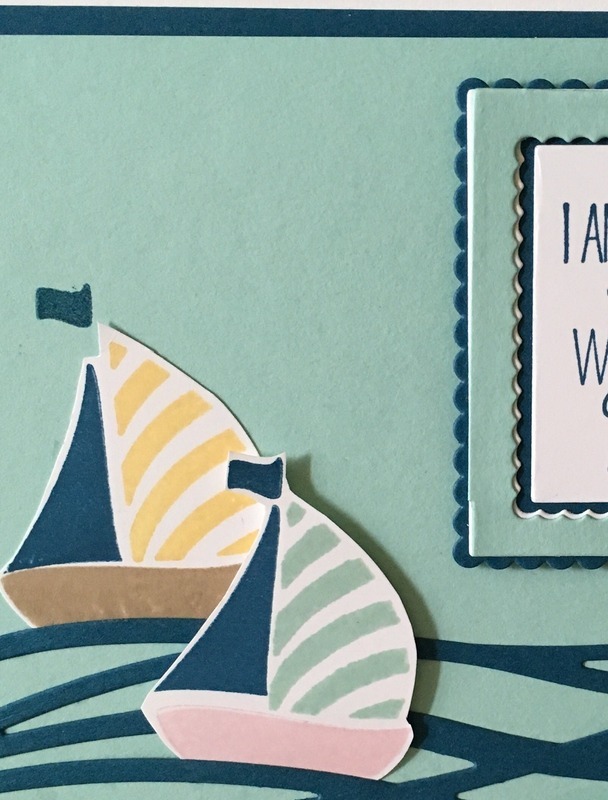 I think the scalloped edges are my favorite part about this card! So pretty!